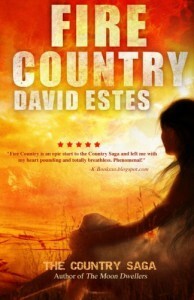 Fire Country by David Estes is one more book added to the young-adult-dystopian hype. The ratings at Goodreads are very good by now and I received that book for free. So I decided to read it, because I'm very interested in dystopian novels. Siena is 15 and a Youngling in Fire Country. When she turns 16 she will become a bearer which means she will be given to a man of the tribe to bear her first child. She can't choose that man. Instead in a ritual called the Call the man will be assigned to her by the chiefs of the clan. That ritual is nessecary, because circumstances in that fictive post-apocalytic future are so bad, that humans only have a expectancy of around thirty years. First, there's Siena. She starts as a very, very naiive little girl. She's very thin, has no friends besides one (oh no, THAT sort of one best friend!). She feels weak and has no confidence. That sort of thing. We know it all. In the book her personality develops with her experiences. From being a weakling to being a fighter. What bothered me the most was that Siena was so damn naive. She did not realise a thing even when a trunk hit her on the head. Then there's her father. He's a leader of the tribe and - who would guess - a very bad guy. He whips her and forbids her to meet her best friend (THAT one best friend). Then there's THAT best friend. The uber guy *roll*. He's smoky as hell, but still the friend of that bony girl. The story was good. A very original setting. Different from so many other dystopian novels. But the story also had it's flaws. I don't want to spoil too much, but one thing did bother me very much: that tribe live in the desert. It's hot, very hot. And that hotters trade with the Icers - another tribe who lives in the Ice Country. But Ice Country is not too far from Fire Country, because Siena is able to at least discover the borders to Ice Country. And that border is not too far. And there are mountains (!). So, WTF? There are mountains in the vicinity and the Fires didn't even notice it? I mean it takes a really big distance to oversee mountains with snow and ice on top of it. I found that very gross. I just calmed me with the thought it might be fantasy and that Fire-guys can't make out mountains because they are short-sighted or something. Well, back to the plot. Siena is very naiive and weak in the beginning. She learns about The Law in school. Lara, a strange girl, tells her, it does not have to be like that. That's all Greek to Siena. She knows the Law and there's no escape and so on. She want's to be that nice new Bearer, but than the luck of the draw is ... ehm. poor. One can imagine the ongoing.